There are some who think I should post more pictures of my gardens on my blog, so I went out this morning and took some random pictures to share. 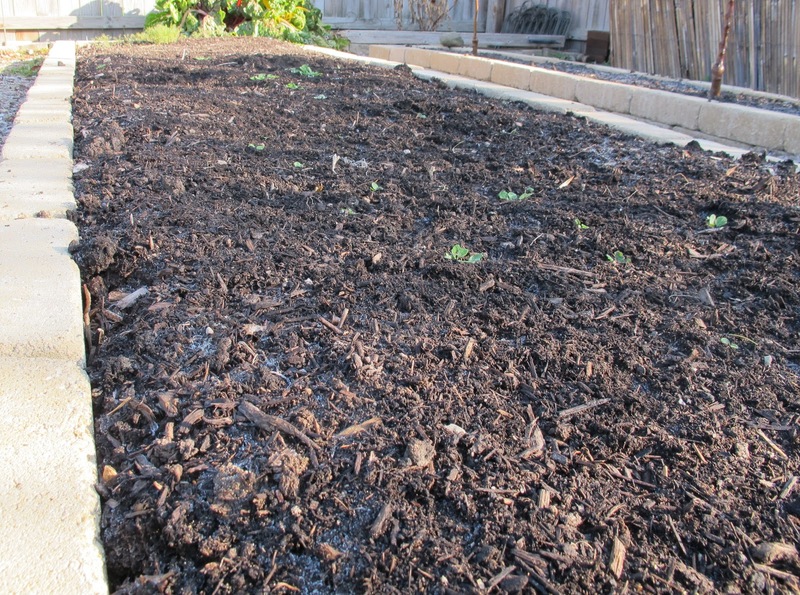 The vegetable garden is dormant now. 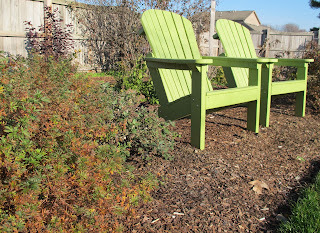 It is considered dormant because our growing season has passed for this year and the ground is cleared and bare. If I showed you this picture in June, and it was still bare ground, I would call it fallow ground because that's what bare ground that isn't planted during the growing season is called. I've been thinking a lot about fallow ground lately. 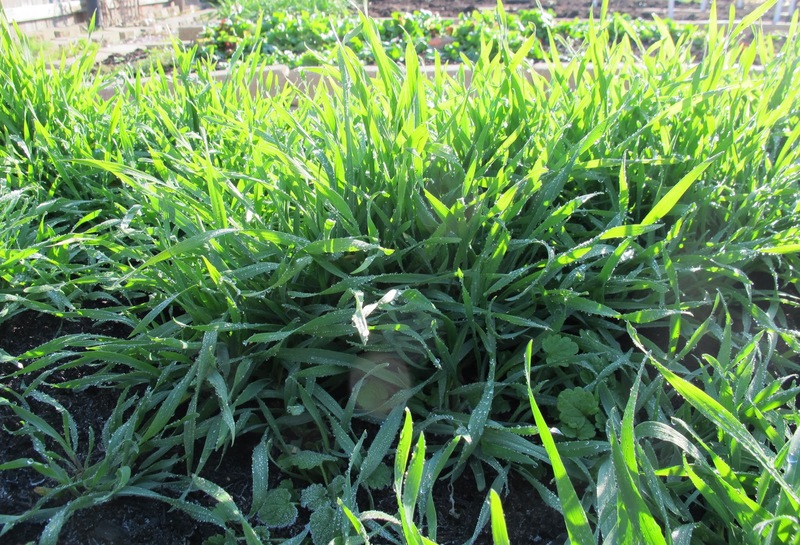 In one of the garden beds, I planted winter rye as a cover crop. This cover crop should benefit the soil in many ways. Its deep roots will help break up hard clay soils and add some organic matter deep down. 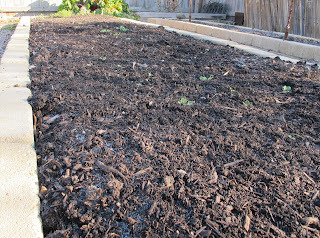 Then when I cut this back in the spring and turn it under, it will add more organic matter to the soil. That's why cover crops are also called green manure. Finally, while it is growing and covering the ground, this cover crop should help control erosion and keep other weeds from growing in this bed. All good. I should sow more cover crops in future years. I spent quite a bit of time this morning looking at the garden border that I call The Shrubbery. It never seems quite full enough, quite lush enough for me. But then I looked at the shrubs in the back and duh, how long have I been gardening? I figured it out. If one is going to plant a garden that is mostly shrubs, some of which will grow rather large, one must realize that it is going to take a few years for it to fill in. I promise I will be more patient with The Shrubbery, and not over plant it, though I still may add a path through it. Inside, I noted that the Thanksgiving cacti are both blooming now. I got a cutting for this orange flowering Thanksgiving cactus from a friend at work. Her aunt had it growing on a screened-in porch for years and I begged for a cutting. Begged. Demanded. Insisted. Asked every day. I was patient, and she was gracious enough to give me a cutting. It clashes nicely with the pink flowering Thanksgiving cactus that I bought about 15 years ago. I am planning a future post about the difference between Thanksgiving cactus and Christmas cactus as it confusing. 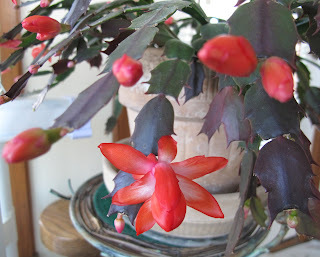 Of course, I don't have any Christmas cactus, so I'll be buying one or two or three, for the blog. For the blog! Readers may recall that a few weeks ago, I planted up the Wardian case. The very one that sat empty, fallow, for eight years. Here's a bird's eye view of what's growing in it now. In typical plant geek fashion, I deviated immediately from any kind of design when I figured out what a great environment this is for plants in general. 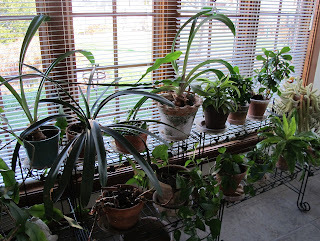 Starting in the lower left, I have a little amaryllis, offshoot of some amaryllis I was repotting. Who could not plant up a little baby amaryllis bulb to see how long it takes to grow to blooming size? No self-respecting plant geek would have thrown it out. In the upper left is a creeping fig. I bought it when I thought I didn't have enough plants on hand for the Wardian case. I may have to take it out if it gets too crowded in there. In the upper right is an arrowhead plant, one that came out of a planter from my Mom's funeral. It's hard to believe that was over a year ago. 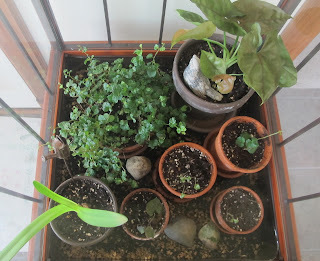 I have several plants from funeral planters that I am keeping going for as long as possible. These new plants are a good companion for some pothos vine that originally came from funeral planters from my Dad's funeral over 25 years ago. Yes, you can keep houseplants growing for a long time. The pot just below the arrowhead plant is a little plantlet of Tasmanian violets, Viola banksii, that I'm attempting to root. So far so good. The other three little pots are Viola labradorica, which I transplanted from outside just when they were starting to go dormant. They responded by drying up, but, but, but, I could see a tiny bit of green coming up from the roots so I am babying them through and hope they continue to grow and one day, hopefully in the middle of winter, they will flower for me. For me! The rest of the sunroom is not as exciting as the Wardian case. It will be more exciting if some of those amaryllis plants bloom. Random pictures of the garden of the garden can be dangerous. You study them, you learn from them, and then you go out and buy more plants. I find the sunroom photo just as exciting as the Wardian case. And yes, you have room for quite a few more plants to be bought because you have to. A gardener has to do what a gardener has to do. Lovely. I especially like the Christmas Cactus. Thanks for sharing. Have a great weekend. Yes, go out and buy more plants for the sunroom! More plants = cleaner air inside. I am sure of it. Get more although your indoor garden is very inviting as it is. My Thanksgiving cactus is stunning right now and I got it from my Mom who died in 1976. Also I have pothos still around from her. I wish she could see what a gardener I have become. Yes, more plants~There's always room for more. Thanks for posting! I enjoyed reading about the cover crops...I've always wanted to know more and will think about doing that in the beds where I grow veggies! 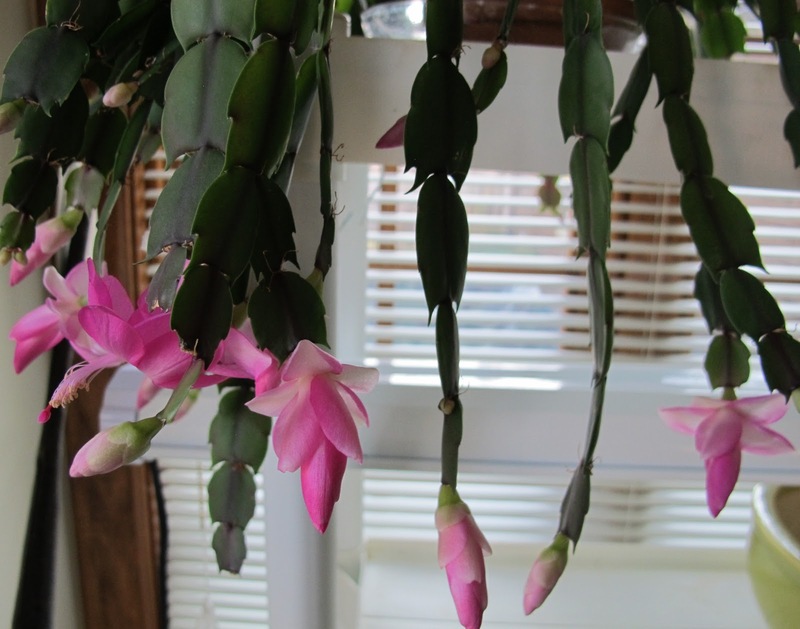 Carol, I'm looking forward to your post about Thanksgiving vs. Christmas cacti--because I never heard of a Thanksgiving cactus until recently! I suppose I could just Google it, but I'd rather read your post about it...so I'll wait. I'm such a failure with houseplants, but I'm determined to succeed. (We now finally have a bit of light in the house after a major remodel, so I'm hopeful.) Have a lovely week!